Rhonda Buckley's documentary, "Terranova Matadora" will screen as part of SJIWFF's Late Shorts on Friday, October 23rd from 9-11pm at the LSPU Hall. 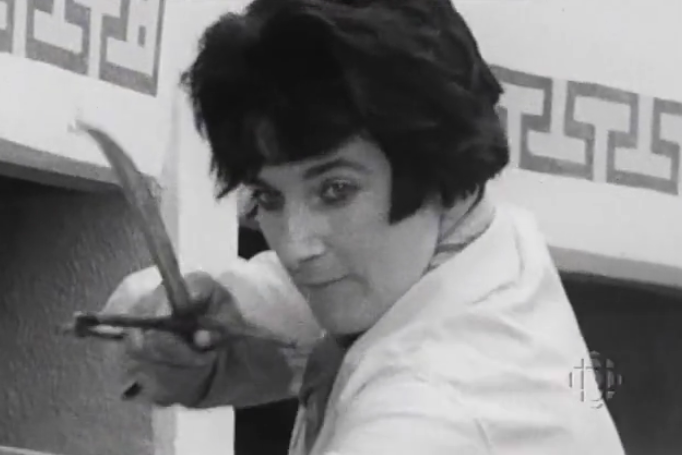 "Terranova Matadora" investigates the life of Carolyn Hayward, a woman who moved from Newfoundland to Spain in the Sixties and became a world famous bullfighter. We talked to Rhonda about tracking down her subject, how she worked around Carolyn's refusal to go on camera and Rhonda's own feminist desire to leave a mark on the world. SJIWFF: Can you tell me a bit about your film? R: My film is called "TerraNova Matadora", it’s about a female bullfighter from Newfoundland, named Carolyn Hayward. She went to Bishop Spencer School, here in St. John’s in the Fifties. Upon graduating she went to Spain to teach English. While she was there she became interested in amateur bullfighting and learned to fight smaller bulls. She went on to become a major bullfighter, she fought 900 pound bulls in Mexico. There are many posters that say she was one of the highest paid bullfighters in the world. Ultimately, I’m interested in feminism and Carolyn is a woman who decided to do something different. She was one of fourteen female bullfighters in the Fifties and the number of female bullfighters hasn’t increased since then. SJIWFF: Is Carolyn Hayward still alive? R: She’s alive, she’s just over eighty. Bravo Canada funded me to make this documentary and they were brilliant to work with. When I found out I had the funding I started my search for Carolyn. I thought she was in Lima, Peru but it turned out she and her daughter had moved to Ontario. It took me a month and a half to track her down. I used the media to try and find her, for example I posted an ad in The Telegram and did CBC Radio interviews looking for anyone who had information about Carolyn’s whereabouts. A man in Corner Brook who is from Lima got on board and tried to find out where she was through his crowd in Peru.We had someone go up and knock on what we thought was her door in Lima. We eventually found her in Ontario. Oddly and challengingly for me as a documentary filmmaker, Carolyn wouldn’t go on camera. There was nothing that I did not try. She’s elderly, she has some confusion and she’s just not comfortable being on camera. There was a sound production house a kilometre away from where she lived but she didn’t even want her voice recorded. What ends up happening in the documentary is that I tell the story through her granddaughter,Valerie, who was living with her in Oakville. Valerie was able to ask Carolyn lots of questions about her bullfighting years for me. SJIWFF: It adds an interesting layer, having the story told by her granddaughter. R: Yes and Valerie is very contemporary, she has a nose ring. She wants to be a filmmaker. SJIWFF: Approaching this film you knew Carolyn Hayward was a wild, unpredictable force was there anything you learned about her that surprised you? R: Someone wrote me anonymously and said you shouldn’t push this person to go on camera or give an interview because a bullfighter has a sacred relationship with the bull. Their articulation about their relationship with the bull is what happens in the ring. Carolyn is a very closed person. I understand that because my mother is eighty-eight and my aunts are in their nineties. They’re all very spry but they don’t talk about their personal lives. Older people are more reluctant to divulge things about their personal lives. I didn’t find out if Carolyn went to Mexico because she was in love. I didn’t find out if she stayed in Spain because she was in love. A lot of the shocking things I learned about Carolyn I learned through archival images. I found a picture of her kneeling in front of a nine hundred pound bull. I went to see some bull fights and kneeling is a very courageous move, not all bullfighters do that. I found a picture of her where it’s obvious that she enjoys the lifestyle, there’s a guitar player in the corner and she’s at a dinner party, surrounded by people from Mexico. In that way Carolyn and I are similar, we both enjoy that kind of lifestyle. I did get to talk to some of her colleagues from her time at Bishop Spencer. Her family was in Gander so she stayed in a beautiful dormitory on Circular Road. Apparently she was a bit of a wild card, she used to sneak out at night and go on dates at the Blue Putee, which was a bar. She did that in a very strict environment, where you’re not allowed to have your skirt a millimetre above your knee. So she was certainly defiant. SJIWFF: Do you see anything of Carolyn in yourself? R: My immediate answer is no. SJIWFF: No desire to fight a bull? R: Definitely not. Valerie said she has no desire to be a bullfighter but she does wish that she had something she felt equally passionate about and that she would receive notoriety for it. I admire that Carolyn chose to be a bullfighter at a time when the career options presented to her as a woman would have been secretary, teacher or nurse. Those options would be really ambitious, most women were home taking care of kids, which is also difficult. She left for Spain as a teenager with her cousin. That was very courageous - to leave Newfoundland for Spain at that time as a young woman. So I don’t think of myself as being like Carolyn but like Valerie, I do have an aspiration to do something that’s remembered. I want to put a flair on the world. SJIWFF: Can you tell me about your next project? R: I’ve started work on a project called "Avon Ladies of Rural Newfoundland", it has a CBC broadcast license. If you’re an Avon lady in a larger city, you can just walk along the sidewalk going from house to house but in rural Newfoundland you’re going up over cliffs and through fields, around wells and around fish plants. The geography of Newfoundland makes it bizarre to be an Avon lady. In Newfoundland some Avon ladies go on all terrain vehicles, in Labrador some Avon ladies take skidoos. I’ve always been interested in stories about rural Newfoundland women and their robust nature. I’m fascinated by their ability to handle everything from finances to childcare, to chopping wood. They’ll just cook up a big feed for everyone in their community. All that imagery will be in the film but it’s also about selling beauty products in an environment that doesn’t always prioritize aesthetics. Mariana Sol Porta on "Discovering Newfoundland"